January: out with a bang! January can be a rough month to get through in New York. Christmas lights are gone, parties are over, the next extended vacation is God knows when, and winter seems to only be getting meaner. All-around unpleasantness permeates the air. Ok, so I’m exaggerating a bit. It’s not that bad. But it is cold. And the lights and parties really are no more. And my next day off really isn’t till May (not kidding). But thankfully, there’s something to help end the month on a good note: NYC Restaurant Week. Eating this almost makes you forget you're not on vacation somewhere warm and exotic. This twice-yearly event, held in summer and winter, invites recreational gluttons like me to food hotspots around the city with prix-fixe lunch and dinner menus. Flaneur and I went through the list of participating restaurants, read the reviews, looked up the menus, and finally decided to brave the cold and venture out in search of our chosen RW pick, Rayuela in the Lower East Side. Almost anywhere would’ve been fine, as long as it meant getting out of the cold, but Rayuela (Latin, though not specific to any particular country) was especially nice to step into. Deliciously warm and softly lit, it had a trendy, relaxed vibe throughout its two levels, without trying too hard to be cool. A Spanish olive tree planted on the ground floor and reaching up through the second added a nice, organic touch. But it was something I wasn’t expecting, though, that really won me over: the seats. Instead of the standard type, each was a super comfortable, couch-like chair. And luckily the food matched the seating in terms of enjoyability. Before we got our appetizers, a waiter came by with some of the most delicious bread I’ve ever had, and that says a lot because I’ve eaten some amazing bread in my day (I’ll save my praise for the breads of Italy for some other day, but know that I could go on for-ev-er). Each roll was almost perfectly round and about the size of a doughnut hole. Ripping them open let out a gush of steam from the warm, soft middle. As if that weren’t enough, they came with a special butter mix, made with chunks of both manzanilla and kalamata olives. If the roll had been the size of a watermelon instead, I would’ve been the happiest girl in the world… but then also maybe the most disgusting. 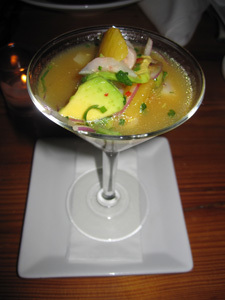 Wonder buns were quickly followed by appetizers, mine a ceviche-like tiradito de merluzo. Made from sliced hake (the so-called ugly fish) served in a martini glass of avocado, onion and tangy citrus juices, I don’t care what this fish looked like when he swam the seas, he was taaaasty. Next up was carne a la parrilla, which is Spanish for awesome hunk of meat. I don’t usually order big slabs of red meat but the menu mentioned yucca and I was sold. (Note: yucca, a potato-like root big in Central and South America, is one of the few things my mom made all the time growing up that I actually love.) 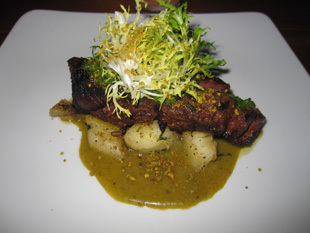 The meat itself was great, soft and juicy, cooked to a perfect medium rare, and served with yucca chunks in a crushed-pistachio sprinkled, creamy sage-poblano sauce. My favorite part of the meal: the sweet stuff. My favorite part of a meal is usually the dessert, so I had high hopes for this one, and I’m happy to report: Rayuela came through. 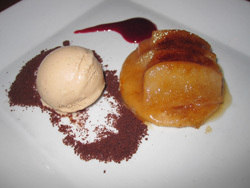 The pera de caramelo I went with, was a warm, caramelized sliced pear on top of a cinnamon wafer served with a scoop of pecan ice cream. A great finish to a great dinner. Once back outside in the blustery night, we hailed a cab, having come to the mutual decision of “screw this, it’s freezing, let’s take a cab home.” No more than a minute after I crawled in and the cab sped off, I was already asleep. Warm, happy and well-fed, like a fat, little puppy.